A week ago, rif and I had dinner at Food Foundry, SS17. rif had the Chicken Chop while I asked for the Spaghetti Carbonara. I actually wanted fettucini but they didn’t have it that night. We were quite hungry that night so we ordered a Lasagna to share. rif’s chicken chop was not bad. 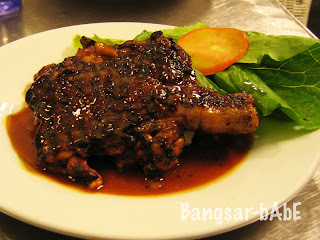 The chicken leg was well-grilled and juicy, topped with thick brown sauce and served with mash potatoes and salad. As lovely as it was, I still prefer our usual order of chicken cordon bleu. My carbonara was alright. It was quite a substantial portion for one. I thought it lacked flavour but this was quickly fixed with generous sprinklings of parmesan cheese. By the time we were done with our food, we were too full to have desserts. Check out my previous post for desserts. Total bill came up to RM 39.59 after 5% tax. Pretty reasonable considering the amount of food we ordered. Verdict: Some minor misses but it’s still one of my favourite places to dine at. “Generous sprinklings of parmesan cheese”? You should tell your readers that you used up the whole bottle of cheese and dried chilli. I would not call that “sprinklings”. 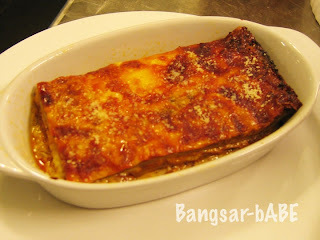 hehe..
but i think the lasagna was alright.. not too bad.. quite tasty..
Hey…you also ate HALF of it. So don’t say I ate all….